The C134 Gayle Bradley was introduced in December 2009. A few hundred of the initial run of the C134 Gayle Bradley are missing the maker's logo. Started by "Sal". "For those not familiar with Gayle Bradley, he produces handmade folders and fixed-blades. He's a Texan who started making custom knives in 1988 and when customers discovered his handmades, his reputation mushroomed, tagging him as a knifemaker who focused on building exceptional knives for hard-use. We believe you will find our Spyderco collaboration impressive not only in its performance abilities but in it's fine appearance as well. Several years ago Gayle won a BladeSports World Cutting Competition further expanding his reputation by claiming his title with a fixed-blade that plowed through everything including eleven-inches of hanging rope. Bradley knives aren't for fingernail cleaners or showmen but for use down on the ground ' getting gritty and dirty. His first collaboration with a production company we're glad to say is with Spyderco. The C134 Gayle Bradley Folder pulls together his reputational forte; anteing up a hard-use folder design to which Spyderco added an exotic and premium blade steel and an unexpected touch of gentrification. The blade is hollow-ground satin finished Crucible Steel CPM-M4. Original M4 made its good name as a tool steel with high resistance to impact. Crucible's version incorporates their CPM-powdered metal manufacturing process with M4 creating a superfine, consistent steel-grain structure heightening its' already impressive impact resistance even more. Its modified drop-point blade also has a weight-reducing swedge located at the spine. The handle is twill carbon fiber with a Michael Walker LinerLock for safe, secure lock up while adding a refined, gentlemanly appearance. Inside are two full-length internal liners adding rigidity to the handle that has screw- together construction for adjustments or cleaning. A four-way hourglass clip lets you choose to carry the folder; tip-up/tip-down, left/right handed." The C134 Gayle Bradley in Spyderco's online catalog. "The Bradley Folder 2 is a direct reflection of Spyderco’s deep commitment to making even the best designs better through Constant Quality Improvement (C.Q.I.). It faithfully retains all the core qualities that made Gayle Bradley’s first-generation design so popular, but in a form that is slimmer, lighter, and more ergonomically refined than the original Bradley Folder. Its slightly longer handle offers enhanced leverage and control, while the subtle texture and flat profile of the scales provide a secure grip that remains comfortable even during extended use. The Bradley Folder 2’s handle features exceptionally thick full skeletonized stainless steel liners, a high-strength LinerLock mechanism, and carbon fiber/G-10 laminate scales that are slightly smaller than the profile of the liners. This handle style offers a hand-filling grip and excellent tactile orientation, while still keeping the knife slim and easy to carry. A four-position hourglass clip allows a full spectrum of carry positions, including both tip-up and tip-down carry on both the left and right sides." 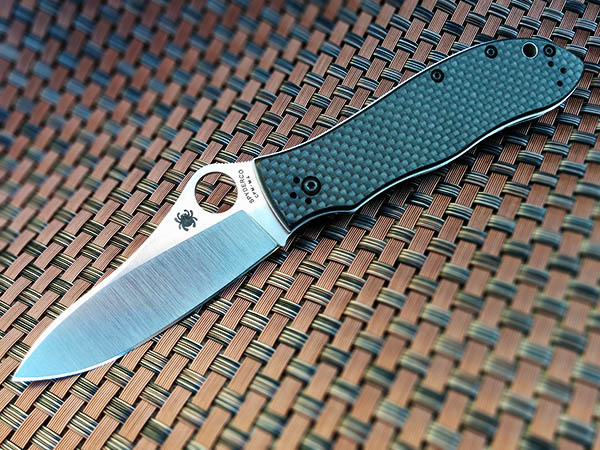 The C134 Bradley Folder 2 in Spyderco's online catalog. A few hundred early examples were produced that are missing Gayle Bradley's maker's mark. Spyderco Designer's Insight Series video interview with Gayle Bradley about his Bradley folder. This page was last modified on 25 November 2016, at 22:25.